Motocross Michigan races have that true motocross mania feeling. Off road dirt bikes of the state. Motocross Michigan riders have arrived. Motocross is increasing in popularity as more and more courses provide tracks and trails for beginning riders, many of whom fall in love with the sport and choose to turn pro in their teens, such as James Stewart, Justin Barcia and Malcolm Stewart. Michigan is quickly gaining recognition as a state that embraces the sport. Boasting a one- mile Supercross course and three miles of hare scramble trails, Morelands Motocross/Supercross Park Off-Road Riding Facility is located in Stanton, with hours daily from 10 am to dusk, weather permitting. Morelands invites all ages and skill levels for bikes, quads and ovrs. There is MX training available on-site and a beginner-friendly course. Visit some of the great camping facilities in the area that provide an opportunity to take a mini-vacation. 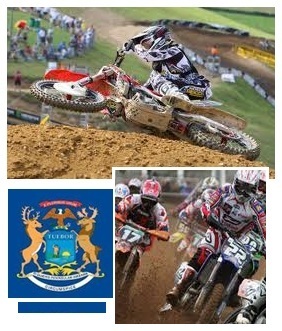 Then head over to the track and enjoy the weekend with the entire family involved in motocross Michigan activity. Millington has Baja Acres offering a separate peewee track to the main track. Camping is offered at no additional cost and a swimming pond, playground and concession stand are available. Catch and release fishing is allowed. Look below for a video of the Baja Acres MX50, which gives an idea of the challenge, jumps and fun at that track. 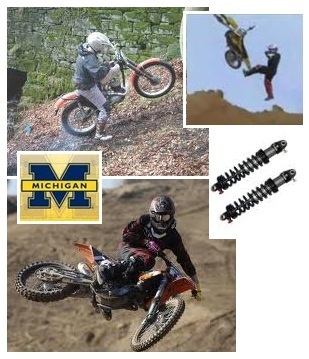 Such Motocross Michigan-based professional riders as Nick Wey, Sarah Whitmore and Nico Izzi have used the track, in operation over 30 years. On 2010, the annual Baja Brawl motocross festival added an Amateur National racing format. The track owners are pleased with the progress of motocross in Michigan and want to see it continue in popularity. Red Bud MX is located in Belding and offers a Wobblers class on the KTM Kids Track for ages 4 to 8 riding a 50cc automatic. The purpose of Wobblers is to give true beginning racers some experience before they enter advanced competitive classes. The program is set up to ensure the love of MX racing in the future and to provide dedicated youths a great place to advance in their skills and tune up on areas causing problems. You will find motocross at the AMA-sanctioned Log Road Motocross in Coldwater, which also features Wobbler class for ages 4 to 8. The peewee track is about 3/8 mile and is separate from the big track. The twenty-man starting gate handles the small bikes. The kids will be on slightly rolling terrain. Skill and age appropriate obstacles are there, in addition to a lower wooded section. The idea is that peewee riders will get more experience when racing 7 to 10 laps instead of the 2 or 3 on the big track. Grattan Raceway Park MX in Belding is a 220-acre facility. Besides modern restrooms, showers and a swimming pool, they have a 40-rider cement starting gate, a mini track for 50ss, 50 Trail, Trail Jr, Trail Sr, and 65 Beginner riders. Spectator stands, a covered viewing area and a full concession area emphasize their readiness for the motocross Michigan crowd.